In an ideal world, our passions and our careers will be one and the same. But for many of us, our passions and creative pursuits often have to give way in order for us to prioritize our 9-5s. About five years ago, I began pivoting my roles within the art world to pursue career ambitions within my family’s business, Huntington Learning Center. While I wouldn’t say that taking this role meant “giving up” my passion for the arts — education and helping kids succeed is a passion of mine, which was a key driver as to why I decided to enter the family business – I knew that this career shift would mean that I would need to be more strategic with the limited time I was able to devote to my creative projects. In order to begin the transition from full-time creative to full-time corporate business woman, I first started to slow down my creative agency, AMH, and ramp up the time I spent on projects at Huntington. This allowed me to make sure that I was delivering on the creative projects that I’d already committed to, while also starting to integrate into the Huntington team. Thankfully, my boss (and mother), Eileen, was very understanding about the importance of staying true to my interests, and encouraged me to transition at a pace that worked for both of us. Looking back, I believe that I was able to successfully transition because my parents and I communicate openly and honestly in regards to our professional and personal goals. Even though I was spending less time day-to-day on creative projects, I made sure that the relationships (both business and personal) that I’d developed over the years continued. I believe that you have to invest in your relationships, so I made sure to prioritize them with regular in-person and electronic check-ins. By being open and nurturing them, I’ve continued to grow the existing ones and expand my network, which has enabled opportunities to come my way. And, it’s reciprocal because I’ll be thinking about who I can connect to continue the expansion. It was actually through such relationships that one of the most exciting creative pursuits I’ve had the opportunity to be involved in came to be. Over four years ago, while on a trip with the Guggenheim Museum, two patrons of the arts and personal friends shared a concept for a film revolving around the art world. These two friends are powerhouse women who make things happen. So, when they approached me to get involved as an associate producer, I said yes! It was because of our relationship and involvement within art that this project came my way. I am beyond grateful to them for welcoming me into the creative process and being part of such an incredible experience. This film has given me the opportunity to invest in friends and an idea that I believed in while staying true to my passions surrounding art and storytelling. Although I had never been involved in a film project before this, I knew the challenge and opportunity would be fulfilling. I am so glad I said yes and got involved with the film. Witnessing this project grow from concept to an immersive experience was truly rewarding. Reception from the audience at the Sundance Film Festival, where the film premiered, was incredibly positive and reinforced all of the hard-work and dedication the team committed to from the beginning. Above all, this example shows that relationships can lead to unexpected opportunities that fuel passions and creation. Time is the greatest curator of all and with my limited time, I have learned that it is possible to have both a fulfilling full-time job and room for passion projects when you allow yourself to keep an open mind and be ready for anything. 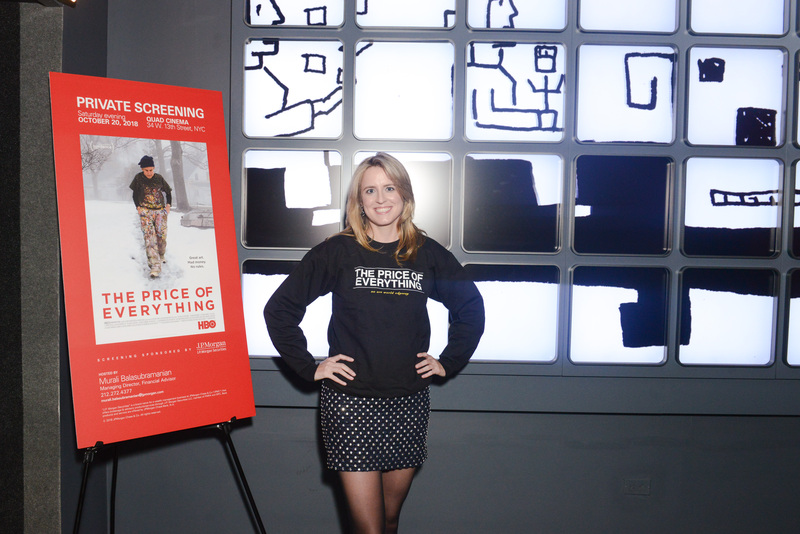 The film is called “The Price of Everything” and debuts on HBO November 12.